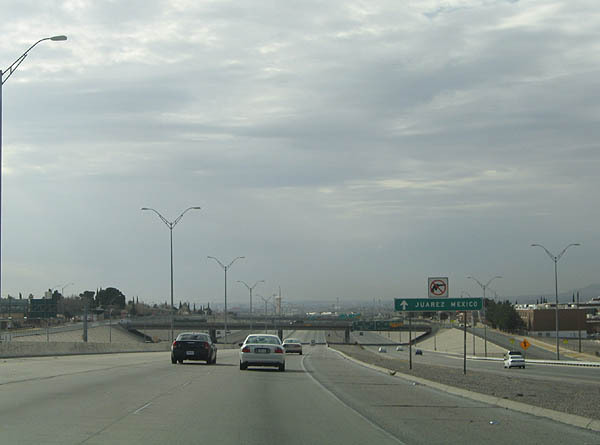 This entrance from the frontage road marks the beginning of the US 54 freeway. Photo taken January 14, 2006. 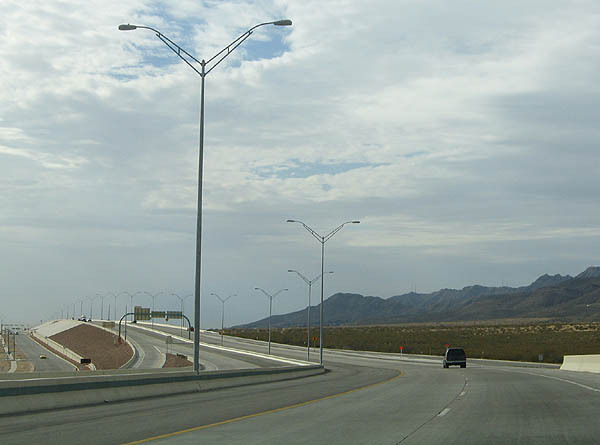 This photo shows the beginning of the freeway lanes of US 54 westbound. Photo taken January 14, 2006. Use exit 31 to reach Sun Valley Drive. There is no exit 30 westbound. Photo taken January 14, 2006. 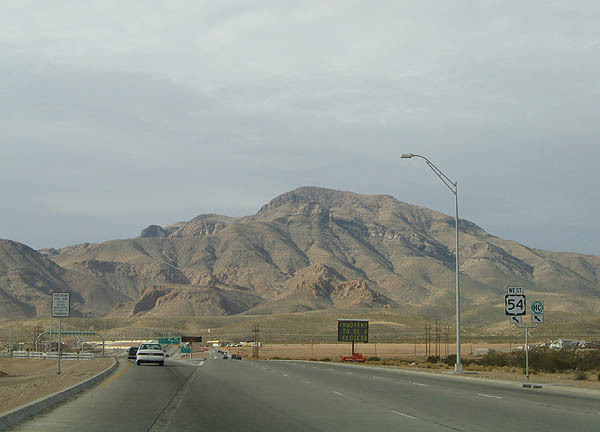 US 54 travels on the east side of the Franklin Mountains. Photo taken January 14, 2006. 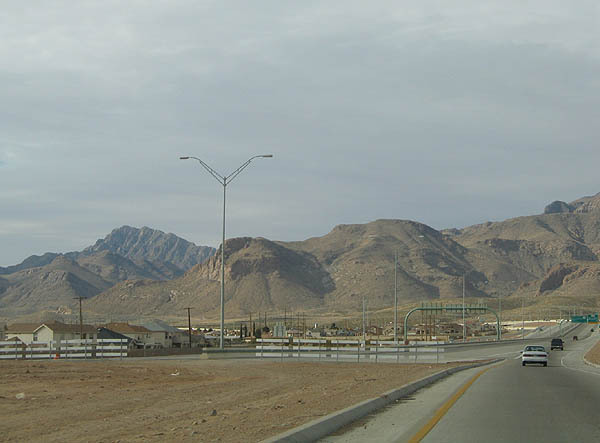 As US 54 nears the mountains, it turns south to parallel the east side of the range. Photo taken January 14, 2006. 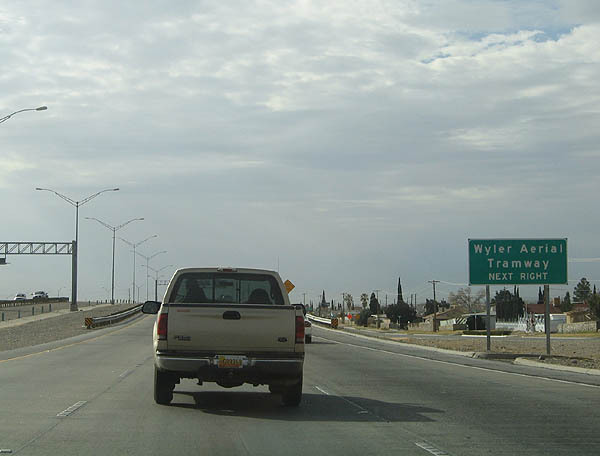 US 54 is a four lane freeway at this point, with frontage roads. Photo taken January 14, 2006. 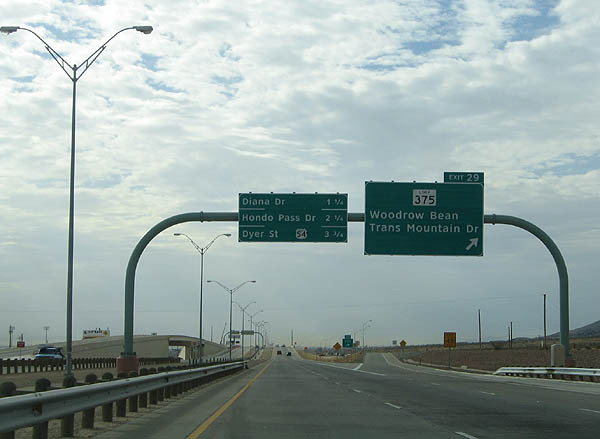 Exit 29 serves Loop 375, the Woodrow Bean Transmountain Road. 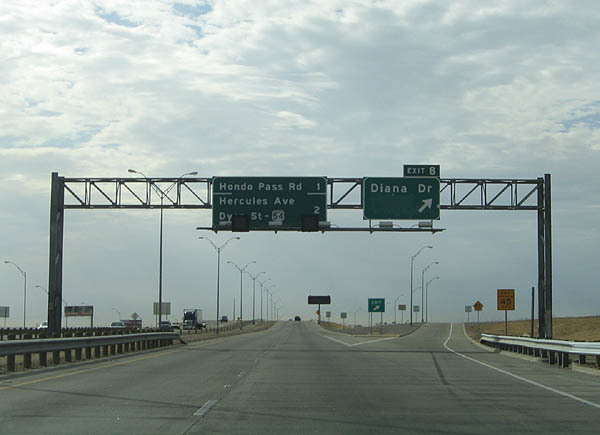 The next exit is Diana Drive. Photo taken January 14, 2006. 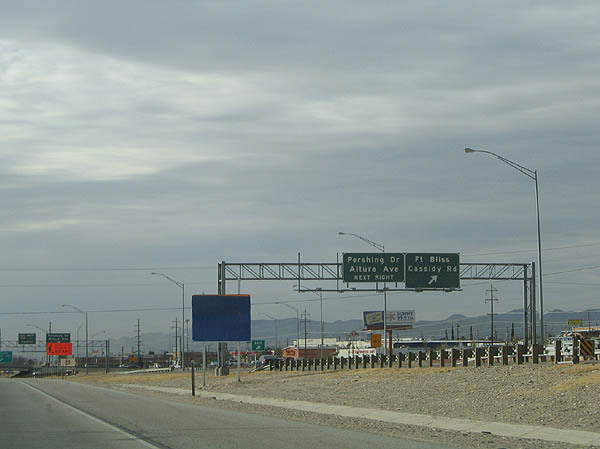 This guide sign advises that hazardous cargo must follow US 54 or IH 10 through El Paso. Photo taken January 14, 2006. 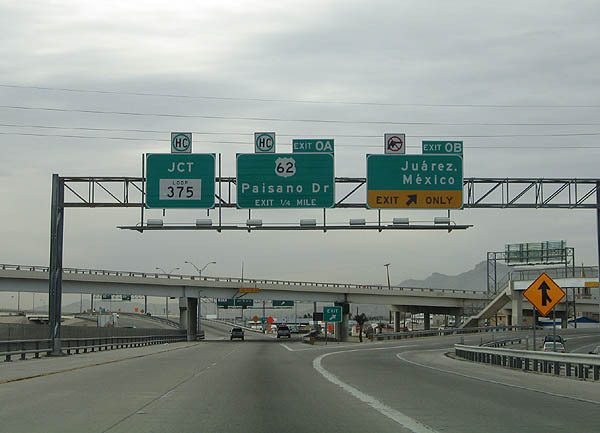 Exit 28 serves Diana Drive. 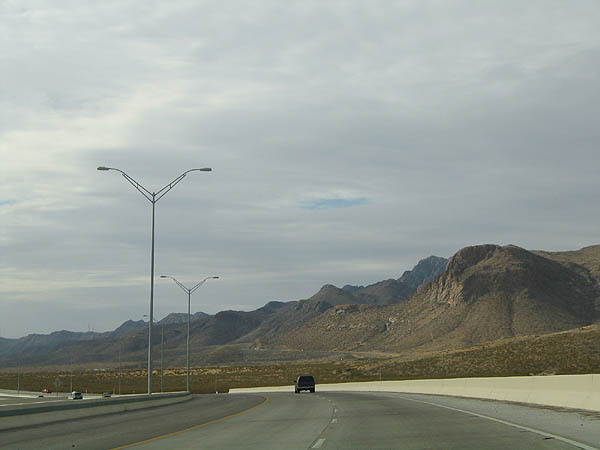 The next exit serves Hondo Pass Rd. Photo taken January 14, 2006. 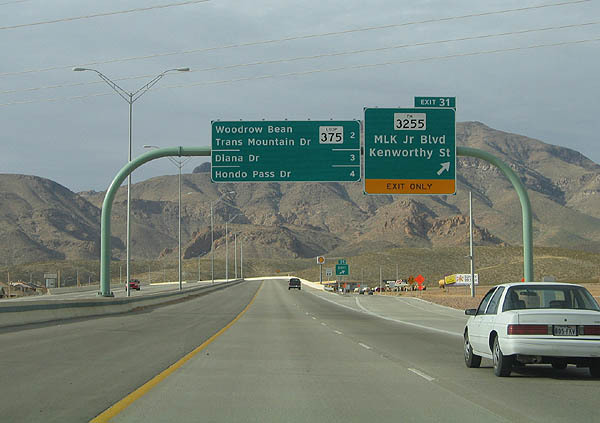 Exit 27 serves Hondo Pass Rd. 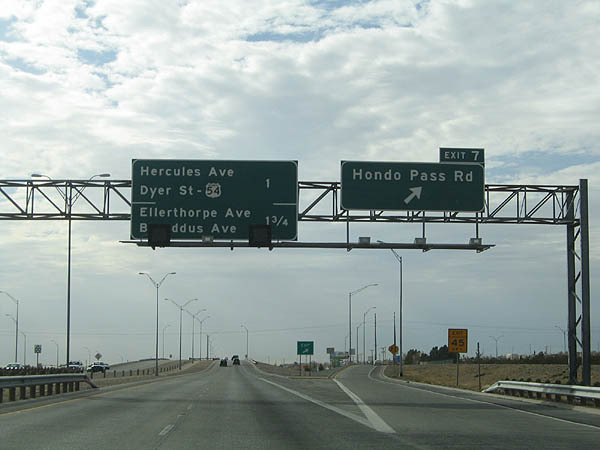 The next exit serves Dyer Street and BU 54. Photo taken January 14, 2006. Exit 26 serves Hercules Ave and Dyer Street (BU 54). The next exit is Ellerthorpe Avenue. Photo taken January 14, 2006. 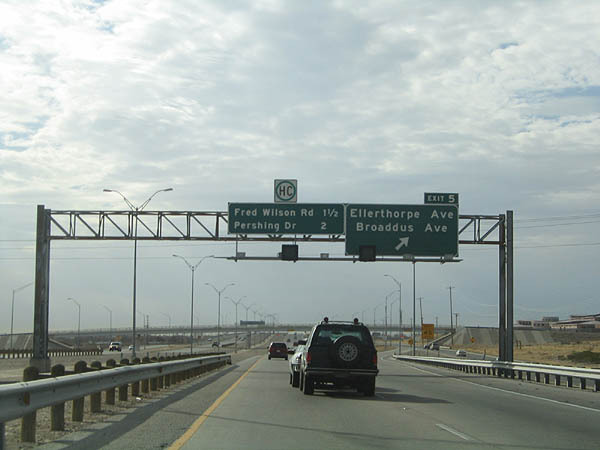 Ellerthorpe Ave and Broaddus Ave are served by Exit 25. 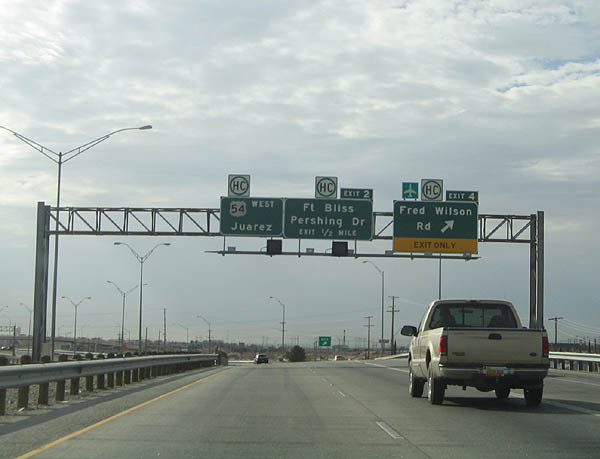 The next exit is Fred Wilson Road. Photo taken January 14, 2006. 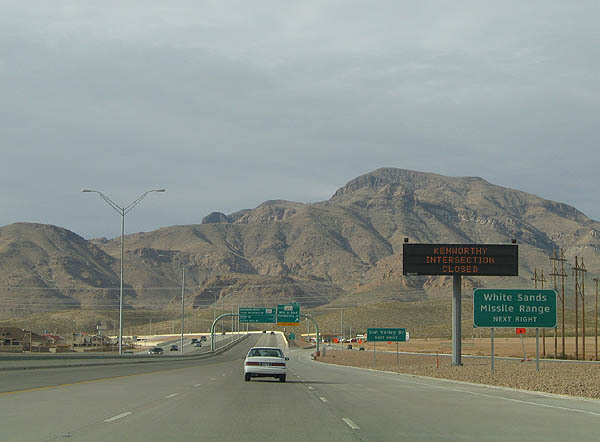 Advance signage for Fred Wilson Road, exit 24. Photo taken January 14, 2006. 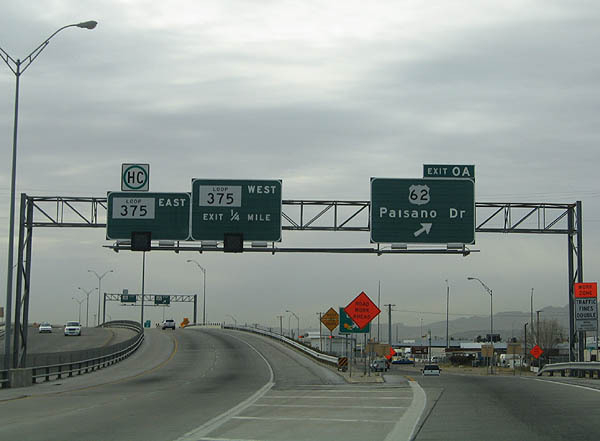 Use exit 24 to reach Biggs AAF and El Paso International Airport. Photo taken January 14, 2006. Fred Wilson Road exits here. 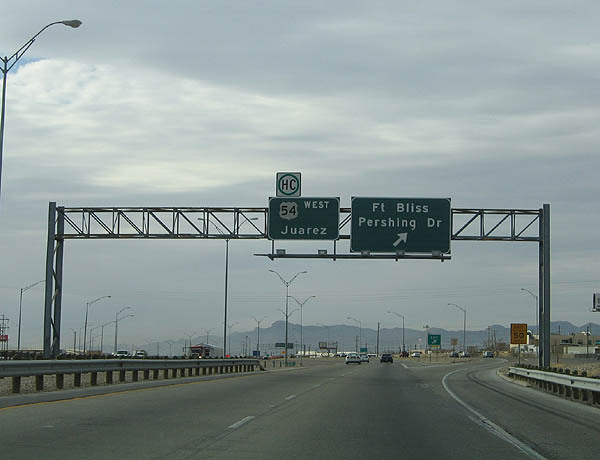 The next exit is Pershing Drive and Fort Bliss. Photo taken January 14, 2006. 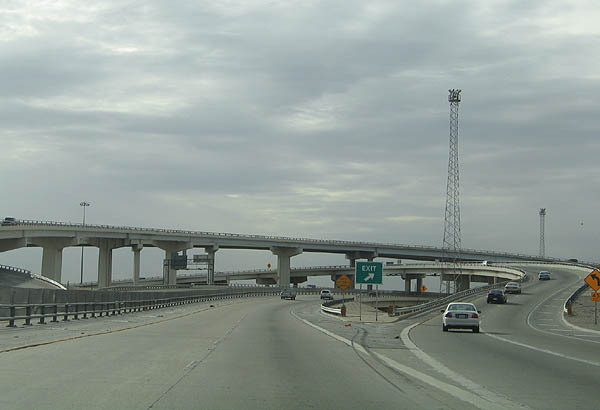 This photo shows the complicated ramp structure at the Fred Wilson interchange. Photo taken January 14, 2006. 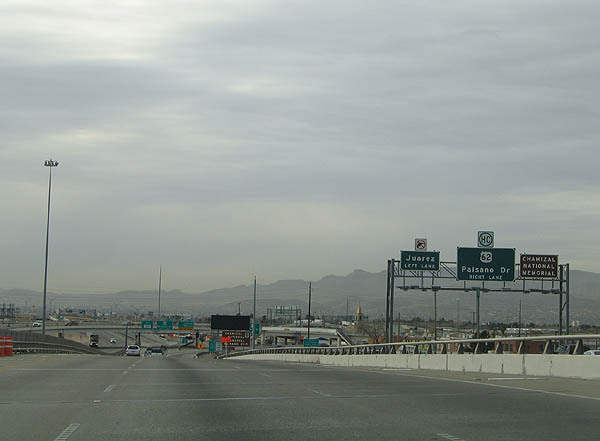 Fred Wilson is a modified three level interchange. Photo taken January 14, 2006. 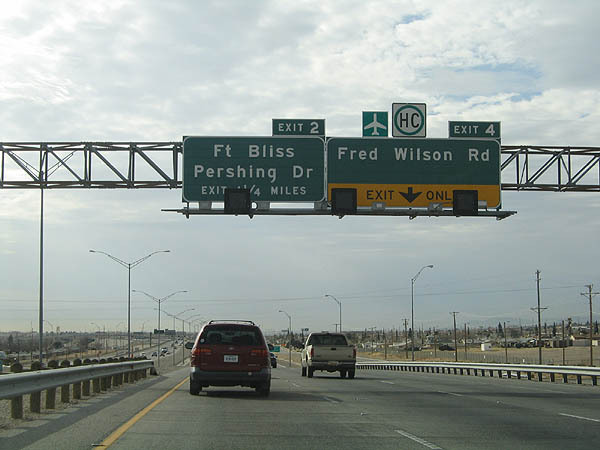 Unnumbered exit 22 serves Fort Bliss and Pershing Drive via the “local” lanes. 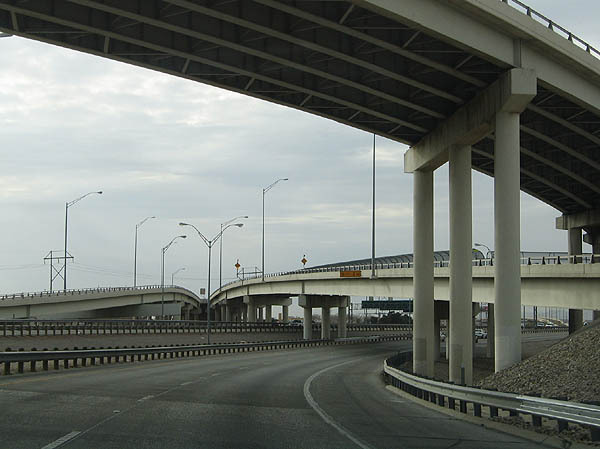 US 54 west splits into a dual freeway at this point. Photo taken January 14, 2006. Traffic destined for downtown and Montana Avenue should use the right lane of the express lanes, to join the local lanes. Photo taken January 14, 2006. 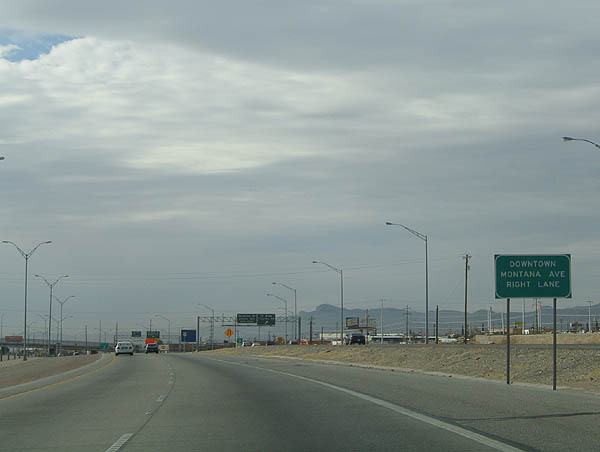 Fort Bliss and Cassidy Road (unnumbered exit 23) departs here from the local lanes. Photo taken January 14, 2006. Pershing drive and Altura Avenue depart the local lanes as unnumbered exit 22. Photo taken January 14, 2006. 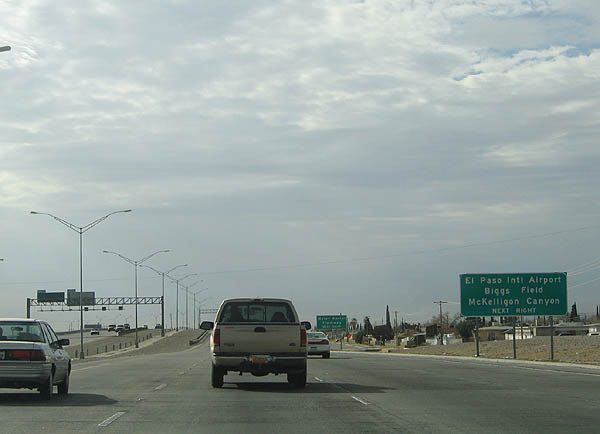 Traffic to downtown El Paso should continue on the local lanes. Photo taken January 14, 2006. 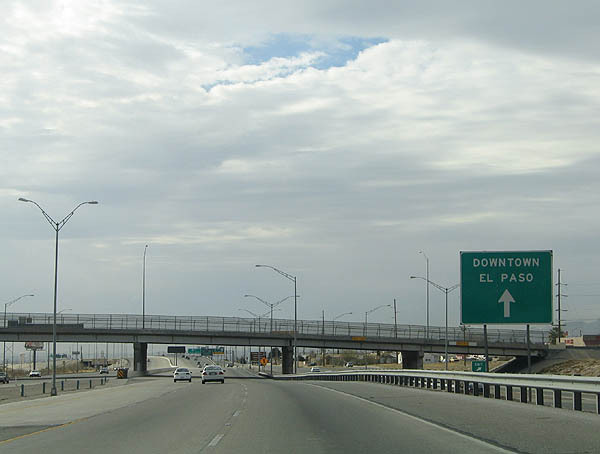 Advance signage for exit 21B, IH 10 west to Downtown El Paso. Photo taken January 14, 2006. 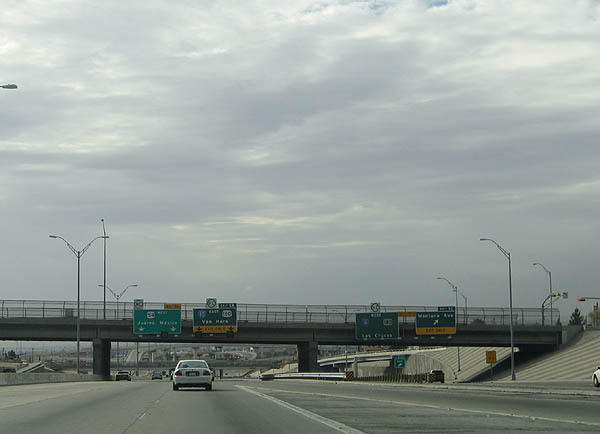 Exit 21B joins the local lanes, which become the ramp to IH 10 west. 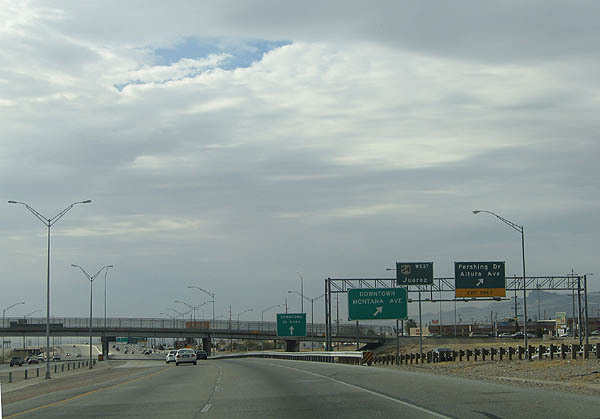 The next exit, 21A, serves IH 10 east. 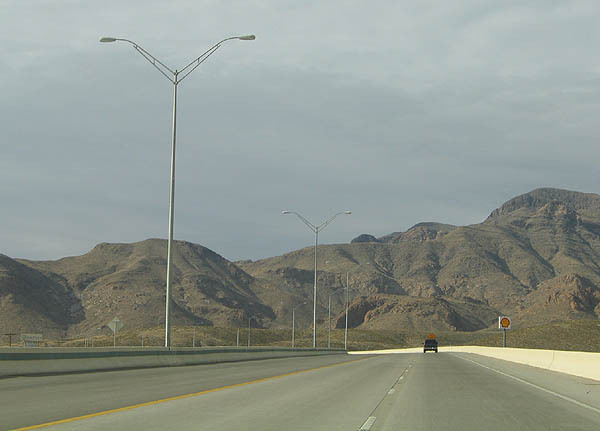 Photo taken January 14, 2006. 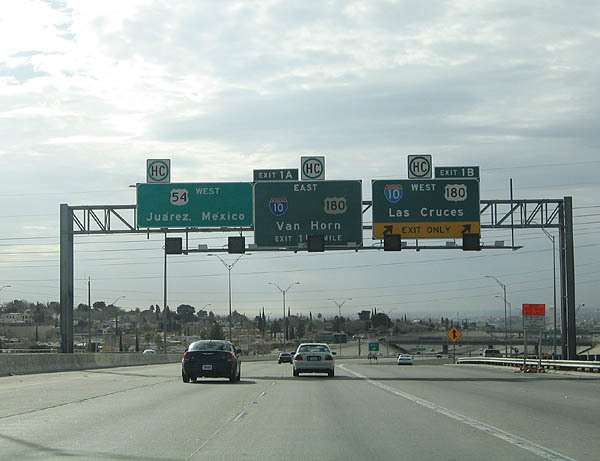 Continue on US 54 west to reach Juarez, Mexico. Photo taken January 14, 2006. Advance signage for exit 21C, Montana Avenue from the local lanes. 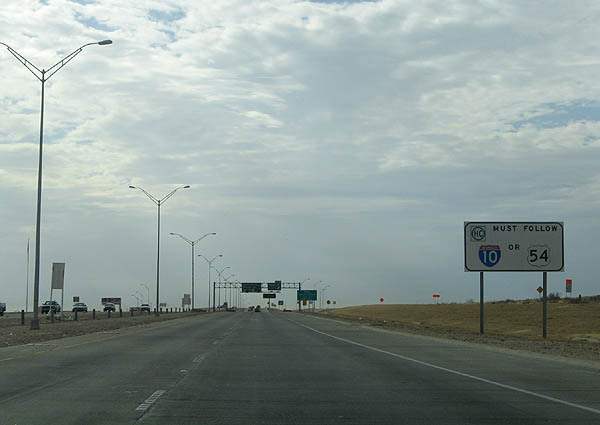 The local lanes are signed as IH 10 west at this point. Photo taken January 14, 2006. 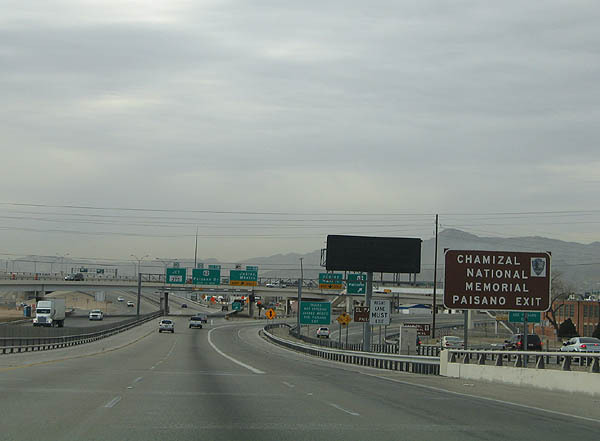 Travelers to the Chamizal National Memorial need to be in the left lane (on both the express and local lanes). Photo taken January 14, 2006. 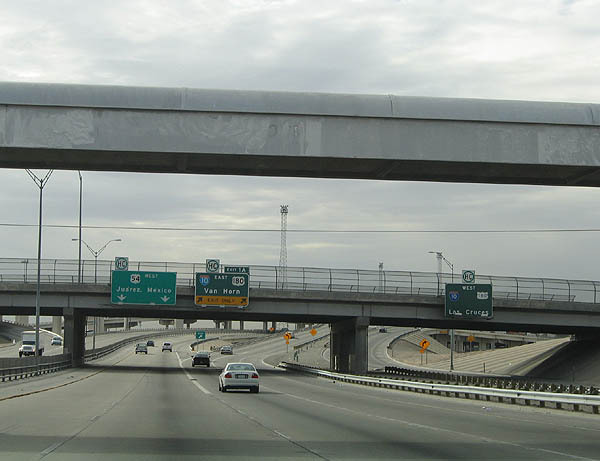 This is the final chance for travelers on the local lanes to rejoin the express lanes. Photo taken January 14, 2006. 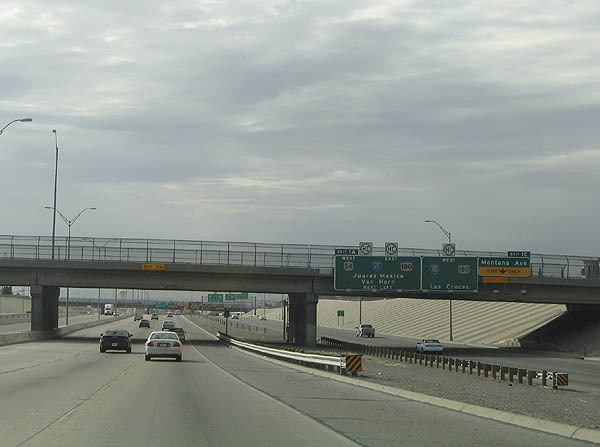 Montana Avenue, exit 21C, departs as the last exit from the local lanes. Photo taken January 14, 2006. This is a view of both the main lanes and the exit lanes to IH 10 west. Photo taken January 14, 2006. 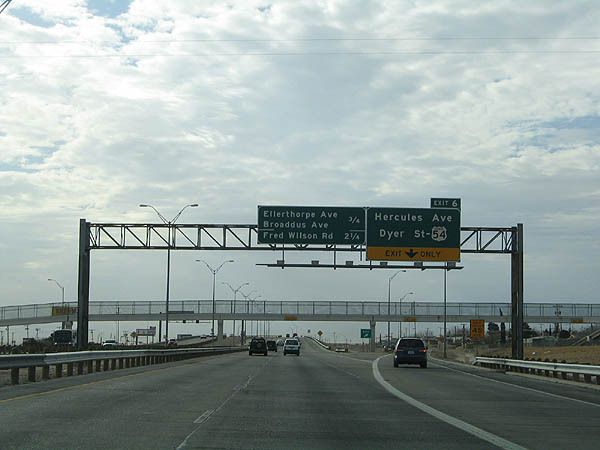 Advance signage for exit 21A, IH 10 east. Photo taken January 14, 2006. At this point, the dual freeway ends as the local lanes turn to join IH 10 west, heading toward downtown. Photo taken January 14, 2006. 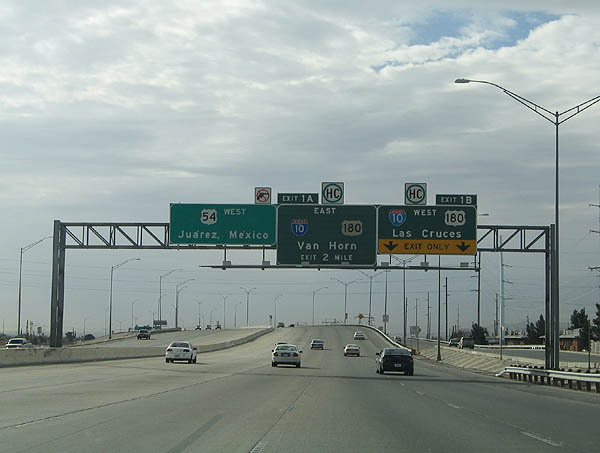 Exit 21A, IH 10, departs here from US 54. Photo taken January 14, 2006. 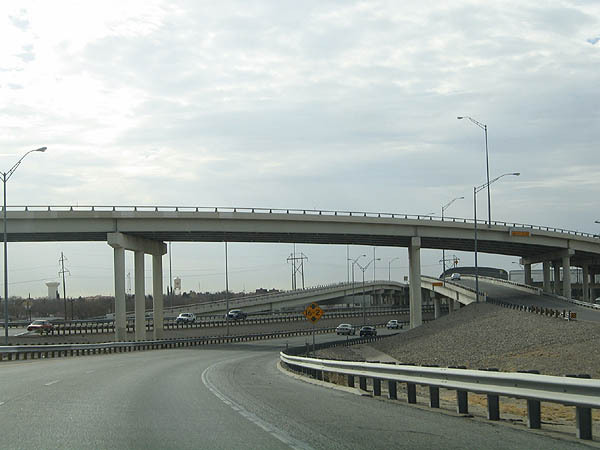 US 54 occupies the second level of the stack as seen in this overview of the stack interchange. Photo taken January 14, 2006. 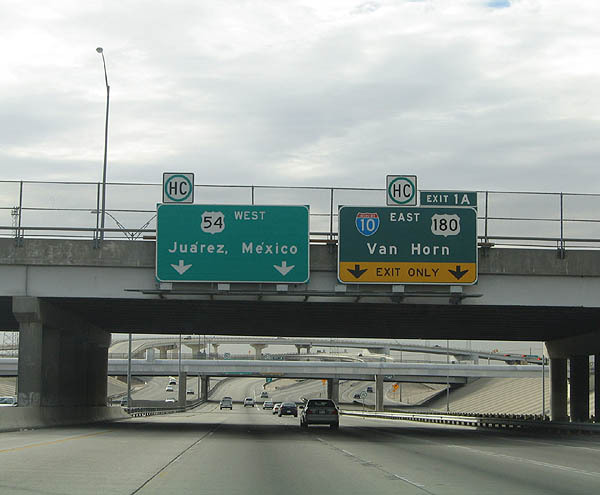 Advance signage for exit 20B, unsigned IH 110 to Juarez, and exit 20A, US 62. Photo taken January 14, 2006. 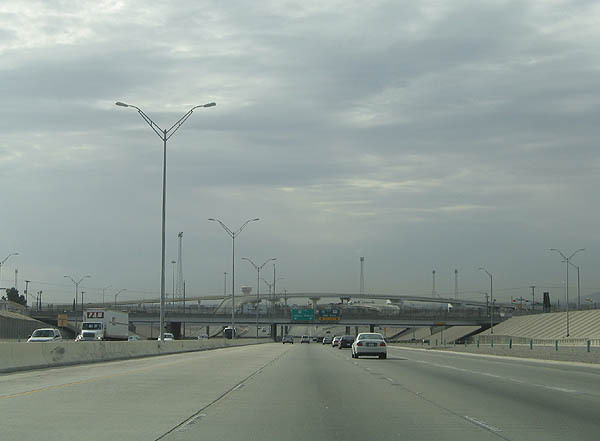 This view shows IH 110, which parallels US 54 at this point to the right. Photo taken January 14, 2006. 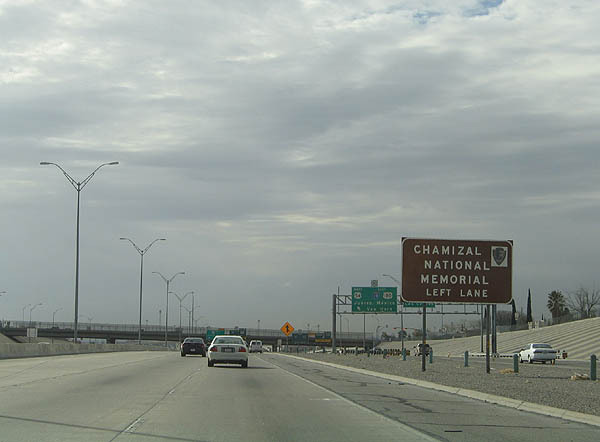 Use the Paisano exit to reach the Chamizal National Memorial. Photo taken January 14, 2006. 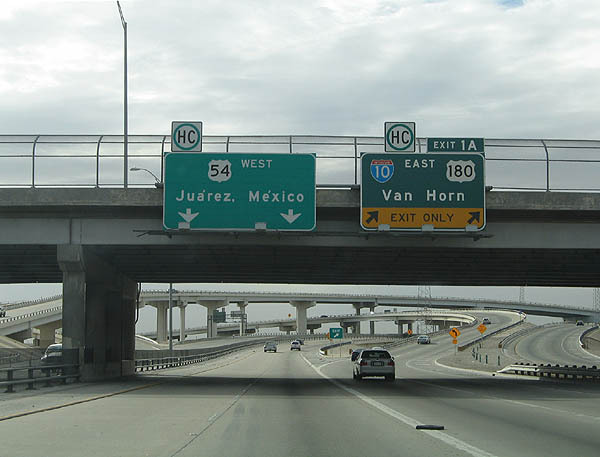 Exit 20B departs for Juarez as IH 110. There appears to have been a route marker at one point on this sign that has since been removed. 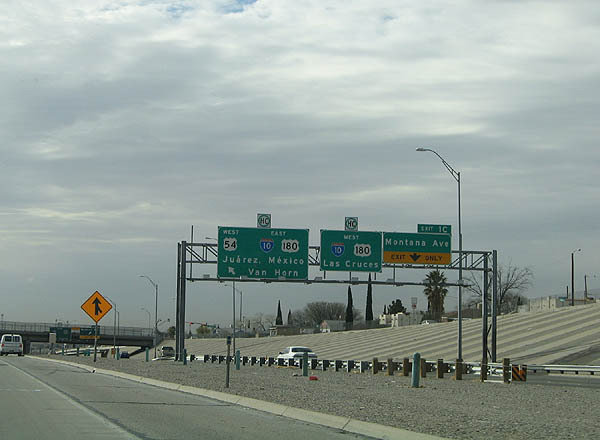 Notice that the reassurance marker has been changed to Loop 375, reflecting the end of US 54. Photo taken January 14, 2006. 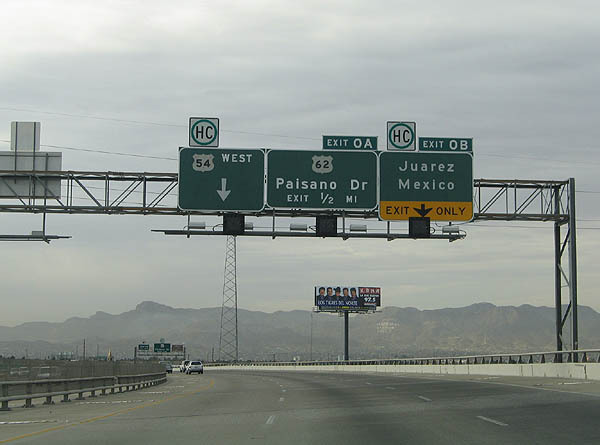 Exit 20A, US 62 (Paisano Avenue) departs from US 54 here. Photo taken January 14, 2006. 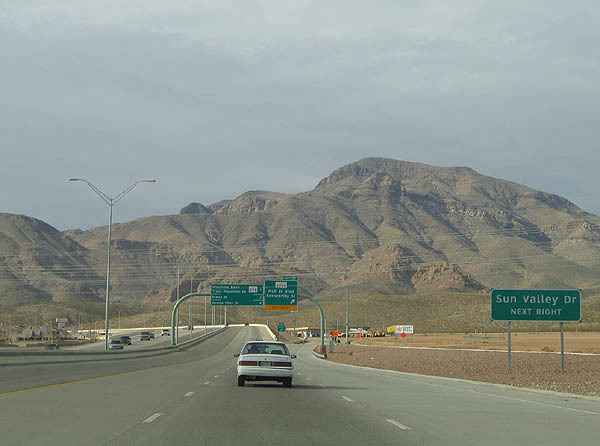 This exit marks the end of US 54. 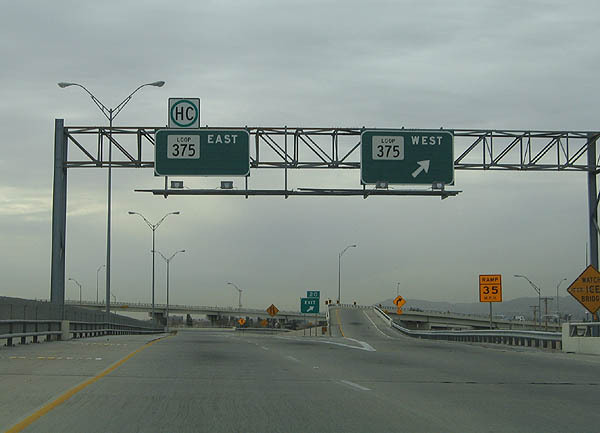 Traffic defaults onto Loop 375 east, with a secondary exit to Loop 375 West. There is no End US 54 shield. Photo taken January 14, 2006.